as editor's choice in iPod Accessory Category. 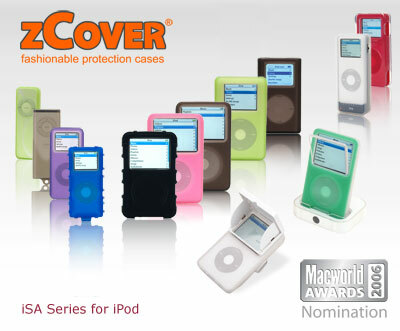 zCover Inc., pioneer and trend-setter in the fashionable silicone products market, today announced that zCover iSA silicone cases have been nominated as the best iPod protection case (under the heading of iPod Accessory) by the Macworld Magazine, the most comprehensive and authoritative resource for the Mac market. "zCover is extremely honored by this nomination," said Sean Sa, Vice President of zCover Inc. "Everyone knows that Apple is an innovator. In presenting its iSA series protection cases to iPod users, zCover aspired to be the quintessence of the industry with its amazing range of products, its promptness and efficiency in adapting to ever-changing consumer needs, its innovative and adventurous spirit, and the consummate artistry of its products. We have received a lot of feedback from our customers and are looking forward to translating some of the inspirations into more stunning future products." The iPod got smaller, but the accessory market can't stop growing, among the case providers of its kind, zCover has always been the first to hit the market. zCover started shipping its iSA micro protection cases fit iPod nano only 2 weeks after iPod nano was launched by Apple. It was with the same incredible speed that zCover released its iSA 5G case fit iPod video. Soon afterwards, zCover released its unique iSA Duet cases which featured an unprecedented duo tone color make: the front half and the back half, which are of different hues, gracefully meet with a perfectly pure and clean seam. Along with these products, zCover also developed its hard crystal screen protector and standard removable belt clip for its protection cases. zCover products are available at Apple retail store, Best Buy Canada, J&R and other big electronic stores. 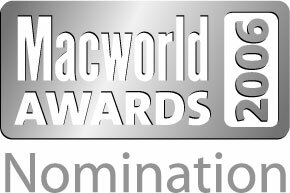 For over a decade the Macworld Awards have rewarded the most innovative and successful products and companies in the Mac community for their achievements and contributions to the industry.